The following provides a description of Alert Triggers and how they can be Grouped and Sequenced to achieve various types of alert requirements. Trigger events form the basis of all alerts within the timetotrade platform. A simple example of a trigger event, is the price rising above 100. Alerts can consist of one or more trigger events. 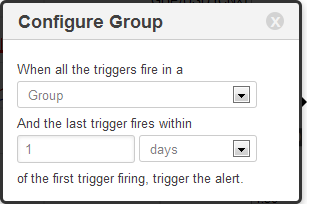 Where there is more than one trigger in an alert, the triggers are grouped together. See the trigger groupings section below for information. There are 8 types of trigger events, all of which are based on two values interacting with each other. The first value is always an indicator and the second value can be an indicator or a constant value (such as '70'). An indicator can be as simple as the 'high' price, or more complicated such as the Weighted Moving Average of the RSI of the Low price. Trigger events are evaluated either on each tick during the interval, or once per interval either using a tick value during the interval or at the value at the close of the interval. Evaluated as true when the first value goes from being below or equal to the second value, to being above the second value on the next interval. Once per interval, either the close of the interval or if checked on each tick, when the conditions are met during the interval. Evaluated as true when the first value goes from being above or equal to the second value, to being below the second value on the next interval. Evaluated as true when the difference between the previous interval and the current interval is positive and is greater or equal to the second value. Evaluated as true when the difference between the previous interval and the current interval is negative and is absolutely greater or equal to the second value. These are similar to the 'increase by' triggers, however the difference of the first value is given as a percentage (being between 0 & 100). These are the similar to the 'decrease by' triggers, however the difference of the first value is given as a percentage (being between 0 & 100). Evaluated as true when the first value is greater than the second value. On each tick during the interval if 'check on each tick' selected, or at the close of the interval. Evaluated as true when the first value is less than the second value. Triggers can occur at one of two different times, depending on configuration; the default is to check the trigger at the end of the Interval. In addition to this, triggers can also be checked on each tick during the interval in real-time. These triggers, therefore, can occur at any time during the interval, for example, 1:31 pm on a day interval. Please note, that real-time triggers have subtle differences compared to triggers checked at the end of the interval. The 'CLOSE' indicator refers to the price of the tick from the market. Whereas 'OPEN', 'HIGH' and 'LOW' are unchanged in their behaviour. When back testing; real-time triggers are treated as triggers that get evaluated at the end of the interval. This difference in behaviour will lead to a difference in the performance of a strategy in the real world, therefore forward testing via simulated trading is recommended. Real-time triggers can only occur once per interval (except 'above' and 'below' triggers). This means for a trigger with a month interval, if it occurred within the first minute, it could not happen again for another 30 days unless the alert is manually paused and reactivated. Thus, if an alert has a reactivation time shorter than the interval of the real-time trigger, the alert still cannot trigger until the next interval of the trigger begins (i.e., the following calendar month for a one month interval). Because the real-time trigger can occur at any point in the interval, groups and sequences with timeframes will need to account for the fact the trigger can happen in the first or last millisecond of the interval. Thus when in a group with a standard trigger the two triggers could occur within the same second, or an entire interval apart. When there are multiple triggers within an alert, there are three different grouping behaviours to choose from. The choice of grouping determines how the alert trigger events are evaluated. On all group types an optional time frame can be set. Doing so adds a requirement that the last trigger event must be evaluated as true within the specified time period from the first trigger event being evaluated as true. Due to the possibility of the triggers in the group being from different exchanges around the world, the trigger event times are converted to UTC to account for timezone differences. Please note that the time frame will take into account weekends, holidays and closed hours such that a trigger event at 23:59 on Friday and a trigger at 22:01 on Sunday are 2 minutes apart. Not 48 hours, 2 minutes apart. If the group spans multiple exchanges; then holidays and close hours are only used if all of the exchanges are closed at that point in time. In a Group the alert will activated if all of the trigger events are evaluated as true, either within 'any time period' or within the allocated group time frame. The trigger events can be evaluated as true, in any order. Immediately after the group is activated, it is reset, such that all the trigger events must be re-evaluated as true for the group alert to be activated again. An alert notification will only be sent if the last trigger is evaluated as true, which in this example is T1, within 24 hours of the first trigger event T3 being evaluated as true. An alert notification will only be sent after the last trigger event is evaluated as true. In the group above for example, T1 may occur many years after the initial trigger T4 occured. 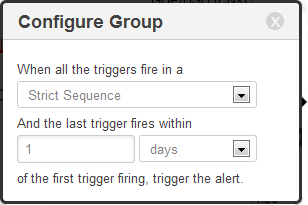 In a Sequence the alert will activate if all of the trigger events are evaluated as true in the listed order. These triggers must evaluated as true in the order that they are listed in the alert. The same trigger can be placed in multiple positions within the sequence. This allows for the detection of repeating patterns, using the same criteria e.g. the Moving Average must increase by 0.1 repeatedly. Sequence alerts can have many overlapping separate states at a given point in time. For example each time the first trigger event in the alert is evaluated as true, a new alert sequence will be created using the most recent trigger event time of occurrence. As each sequenced alert is activated, the other states are maintained. There are two types of sequence alerts in the timetotrade platform. The trigger events must be evaluated as true in the exact sequence that they are listed. If any of the trigger events occur out of order the sequence progression is reset i.e. the first trigger event in the sequence must be re-evaluated as true once again. The trigger events must be evaluated as true in the following order; T1,T2, T3, T4 for the alert to be activated. T1,T2, T4, T3, T4, in this example, when the first T4 trigger event was evaluated as true, it resets the sequence position, thus preventing the alert activating when T4 occurred for the second time. The alert trigger events must be evaluated as true in the sequence they are listed, however repeated trigger events within the sequence will be ignored. When a trigger event within the sequence is evaluated as true, the state of the alert sequence is progressed. The trigger events are evaluated as true in the following order; T1,T2, T3, T4; at this point the alert will activate. Note: given this set of occurrences the loose sequence alert behaves exactly the same as a strict sequence alert. T1,T2, T4, T3, T4; in this example, when the first T4 event is evaluated as true, it is ignored, allowing the sequence to continue once T3 was evaluated as true. T1,T2, T1,T3, T2, T4,T3, T4; then the alert activation would have occurred twice, even though the blue sequence of occurrences started before the green sequence finished. Please note, if two tracked positions end up being activated at the same point in time, the oldest will be discarded.